North Karnataka is home for some of the most beautiful historical marvels of India-Hampi, Badami, and Pattadakal. Hampi and Pattadakal are considered as world heritage sites by UNESCO. We had visited Hampi a few months back and had been wanting to visit the sites of Badami, Pattadakal and Aihole since then. Finally this time again it was the call of these Architectures of Ancient India which our hearts couldn’t defy. Here we present you with the details of our visit to Badami, Pattadakal and Aihole. Badami’s beauty begins at the mouth of an artificially created Agastya Tirtha lake surrounded on either side by beautiful sandstone hills. The places to go around Badami are abundant but the time in hand is limited as all the places close by 6pm. During this trip, we explored mostly the extravagantly rich ruins of the Chalukya kingdom. Badami is located at a distance of 130km from Hampi. If you are visiting Hampi , take two more days out to capture the ethereal beauty of these temples. 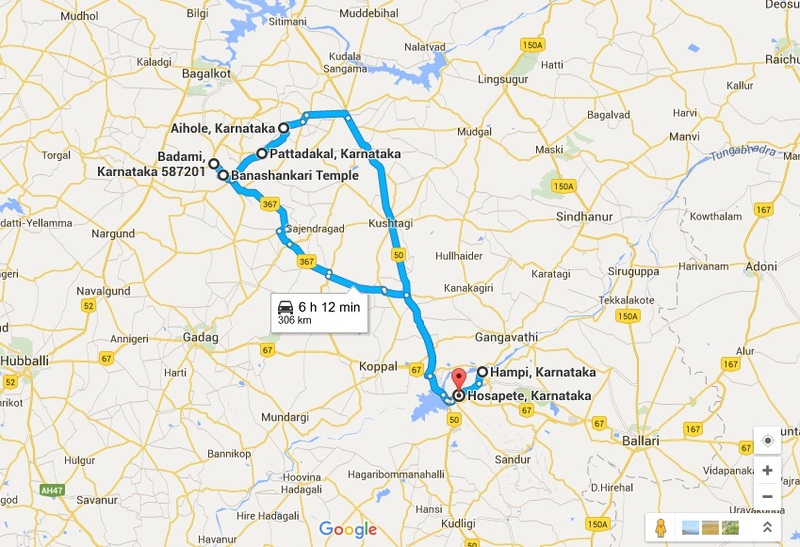 We left Hospet(approx. 10km from Hampi) at 8am and drove through the National Highway enjoying the morning breeze. The roads are in excellent condition and well suited for a long drive. We crossed the soothingly green paddy fields around and the Tungabhadra Dam with the sun shining bright yellow. On reaching a town called Koppala, we took a diversion towards Badami. Upon arrival in Badami, checked into the hotel Clarks INN, which is located very near to the important attractions. We started out sightseeing with Malgatti Shivalaya Temple. Among the many temples at Badami, this is significant from many points of view. It is very well maintained by the archaeological department. On the North hill of Badami, Malegitti-Shivalaya is perhaps the oldest and finest temple. 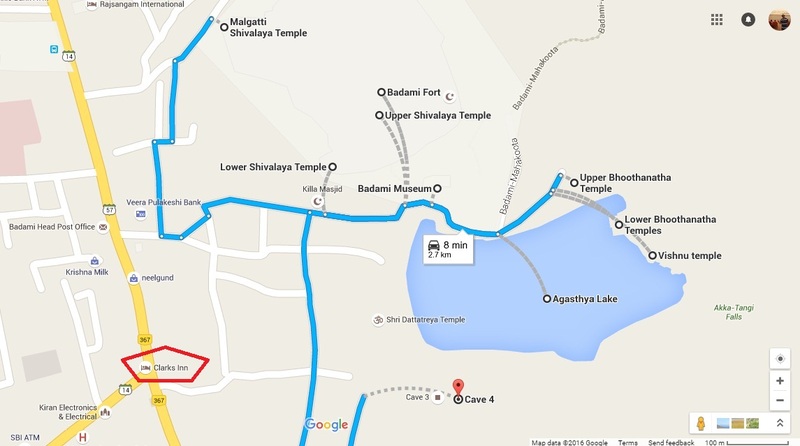 The two other temples are upper & lower Shivalaya temples. Do not confuse this with other two temples as the locals do not have a good idea about this temple. This place is few meters off the main road. The vehicles need to be parked a few meters away and one should take a short walk up the hill. The red stand stone structures look flamboyant surrounded by the lush green gardens. We decided to explore the Northern Hill before walking down to the Bhootnath Group of temples. The upper and lower Shivalaya temples are located near the archaeological Museum, which is set up at the foot of the Northern hill. A short trek uphill amidst the marvelous rust red sandstone cliffs will lead to these temples. This would be the best way to catch the breathtaking sight of the Northern and the Southern hill forming the boundary of the artificially filled Agastya Tirtha lake. The experience of walking through the pathway between these naturally patterned large cliffs with horizontal cracks was fabulous. This makes Badami a favoured destination for rock climbers. Before reaching the Lower Shivalaya, a very narrow path which is almost hidden between to cliffs opens up to a small plateau with the two beautifully standing stone structures. These can be spotted at the beginning of the trek. The Lower Shivalaya temple is located on a flat land at half way through the trek. This small temple standing alone to the end of the cliff is a true beauty. Going further, after walking through the remains of the fort we finally reached the Upper Shivalaya temple atop the hill. This place with few small ponds around is very pleasant. The view from here spanning both the hills and their forts surrounding Agastya Tirtha Lake with Boothnath temples at its banks and the rock cut caves is incredible. There is also a way leading to a small open space surrounded by the fort built around. It is astonishing the way it is scientifically constructed to produce echo even being totally open. This fort is visible from the Malegatti Shivalaya temple but cannot be reached from there. After capturing all the beautiful views from the place, we walked down the hill. The archaeological museum at the foothill gives a good knowledge of Chalukya empire and the Badami sculptures. The next visit was to the Bhootnath Group of Temples majestically standing at the banks of Agastya Lake. This place is at a walkable distance from the museum. These temples, dedicated to Lord Shiva are believed to be built during the 7th century. The temple with footsteps from the lake stands mystically with thick forests and the Southern hill in the background and the green Agastya lake in the foreground. During the rains, its beauty doubles with the waterfalls from the Southern hill in the backdrop. The structures here having antique doors with ethnic stone carved borders are glorious. A small walk behind the temple helps to explore few half done yet excellent carvings of Hindu Gods on the rock which are certainly worth a visit. The cave temples are a set of four temples carved on the Southern sandstone hill. We reached the cave temples by 8am. This is the best time to visit as there would be no tourists in the cave area at this time and that’s what we were expecting to explore Caves in detail and capture few shots. Three of the caves have the carved structures of Hindu gods and goddesses and the fourth one is a Jain temple. These sandstone monuments with different hues of brown and red located in the mid of greens are extravagantly flattering. The shades of different colored patterns on the stones and the caves are enchanting beauties and one must not miss visiting these places. We continued our journey to Pattadakal and Aihole after visiting the Banashankari temple at Badami, which is known for its beauty of interior architectures including the famous lamp towers and the square shaped tank, Haridra Tirtha built in front of the temple. It is surrounded by a walkway with stone Mandapas on three sides. The road leading from Banashankari temple to Pattadakal is 15km with an average condition but that did not bother us because it beautifully wends its way through huge fields of cotton, groundnuts, sunflowers and other vegetation. Pattadakal is a magnificent campus with a lavish group of amazingly carved stone structures. It is a quiet and clutter-free place surrounded by beautiful garden and very neatly maintained. The group of monuments at Pattadakal consisting of nine temples are built in different time periods. The architectural style here is a wonderful fusion of Dravidian (Chaluykyan)-North Indian(Nagara) art. Of all the structures in this place best described as ‘beauty in ruins’, one temple with Shiva Lingam is being worshiped with a huge Nandi on the opposite side. One cannot avoid being absorbed by the beauty of the intricate beauty of this blended architectural marvel. We did not forget to savor the authentic lip-smacking North-Karnataka food – “Jolada rotti with tasty kalu palya” at the local eateries near the place. After lunch, we headed towards our last destination Aihole which is 12km from Pattadakal. Aihole was supposed to be a school of Architecture during the 7th century when Chalukya Dynasty ruled. Aihole in total has hundreds of temples but only one premise which includes a group of monuments is developed and maintained as a place for tourism by the Karnataka State Government and Archaeological Survey of India. As we entered this place we were amazed to see a large temple which also looked like Parliament of India due to placements of pillars on its circumference. The other structures were different kinds of houses and temples as models for students. It was overall a brilliant experience to see this ancient school. The fun starts when you move outside of the complex and roam around the town of Aihole. We loved Aihole the best because the village thrives among the ruins of old temples and the houses here look colourful and unique. When you are here, do not forget to capture these unique village settlements of Aihole. Karnataka truly deserves an award for the excellent maintenance of its monuments. If you are a history and archaeology buff, you certainly can not afford to miss visiting the ruins of Hampi and Badami. There are very few decent hotels in Badami and none in Aihole / Pattadakal. We chose to stay at Clarks INN as it is located very close to all the important attractions in Badami. Our window actually gave an overview of the places in our checklist. It is a 2km drive from the railway station. Read more..
Road condition: Good. Expect some broken patches. Our trip plan/Route was a Triangle circuit. – Visit Badami caves in early hours when there is less crowd. – Not many good restaurants on this way and at Badami. We had carried some snacks and fruits which came to our rescue. – There are no hotels in Pattadakal and you wouldn’t have any option for accommodation except Badami. – The best time to check Bhoothnath temple is either sunrise or sunset when the cliff, pond, and the light create magic. It is a photographers paradise. – The Pattadkal, Aihole group of temples – All these are within 25km from Badami. Devote half a day to visit both these places together. – These locations are in the heart of Deccan India– summers can be very hot. Best seasons to travel are Rainy & Winter – July to Jan to explore the UNESCO World Heritage complexes of North Karnataka. Read about Anegundi – the twin city of Hampi which is just a short drive away from Badami. I love your photography- great job! Thanks a lot Rhonda LaBatt 🙂 This place is indeed a photographer’s paradise. How absolutely stunning and your tips for travelling there are so useful. Travelling in India is not for the feint-hearted but there are some amazing sights to see. What a lovely place and the Aihole is really spectacular. Have not been able to go there as yet, hope to make it this winter. Loved your pictures! I’m a photographer and always appreciate great photos in blogs. Thank you Milana’s Travels 🙂 Many sites in India are photographer’s paradises. What stunning photos! Cathedrals and temples are my favorite places to visit in any country. They give you such a sense of a country’s culture and people. Thank you Rebecca 🙂 Great to know about your interests and it is very much true about any country. You must surely make a trip to India to experience its rich culture and heritage. I really need to go to India :). The pictures are beautiful! This experience looks amazing!! And that food..oh man, my mouth is watering! I am bookmarking this for when I get to go to India! Wow, stunning pictures. Looks amazing. I need to visit this place once in my life. Thank you for that. Thank you 🙂 Many places are truly amazing. Appreciate the advice when going there. I think it’s going to be worth it, those temples and monuments are all naturally beautiful and grew well with age. am a true devotee of Shiv, your description of Shivalaya and Bhoonath temple has made me curious about this place. If got a chance will surely visit.